horror stories of disappointing service weâ€™ve experienced. Online rants and YouTube videos of abysmal service are shared with ghoulish delight and a companyâ€™s reputation can take a nose dive as a result of one bad service encounter being uploaded to the web, tweeted, or shared via alternative social media posts or reposts. Itâ€™s every service managerâ€™s worst nightmare. And yet good customer service should never be a companyâ€™s goal. A goal is something that is imposed by leadership but a truly awesome customer experience is the natural result of a corporate-wide culture of excellence. If a company values excellence in every area, excellent customer service will be the natural result. 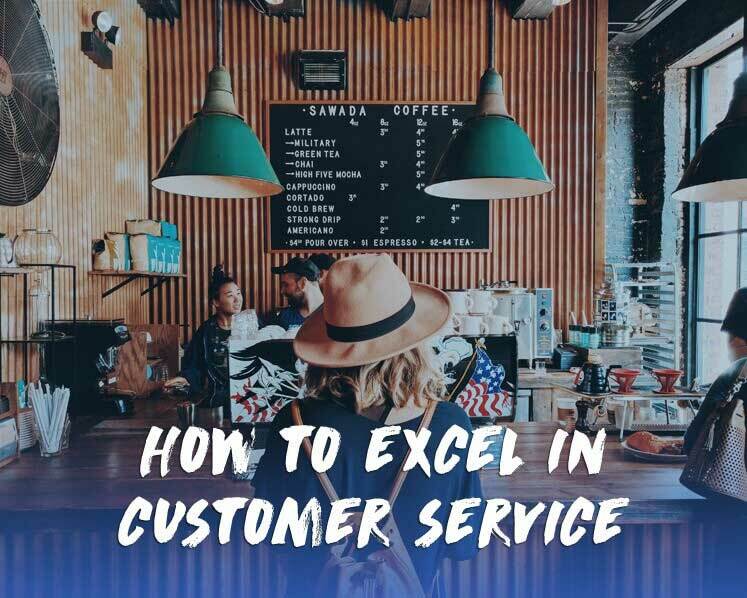 And if excellence is unknown within a company, all the goals, memos, campaigns and ads extolling a companyâ€™s commitment to providing wonderful customer service will fall on deaf ears. There will be no long-term improvement in customer service because you canâ€™t change employeesâ€™ attitudes through a memo or ad campaign. Customer service excellence isnâ€™t related to the type of business you are in or even who your typical employee is. The Wall Street Journalâ€™s 2015 Customer Service Hall of Fame boasts such diverse industries as supermarkets, tech companies, package delivery services and even a fast food chain. Chick-fil-a, with its largely under-21 workforce, ranked just above Apple, with its highly educated tech workforce, so obviously, age and education are unrelated to superior customer service. Then what do Chick-fil-a and Apple have in common? What do they have in common with Marriot, UPS and Trader Joeâ€™s, who also appeared in the WSJ Customer Service Hall of Fame? Each of these companies shares one prominent trait: a commitment to excellence that permeates the entire company. Awesome customer service flows from the culture of each of these companies. It flows from the top down. It does not begin at the customer service managerâ€™s level. It is not forced down to the customer service team as a memo or mandate. Culture trumps a â€œnew initiativeâ€ every time; the act of peer pressure, whether for good or evil, reinforces a companyâ€™s values. We reflect in our attitudes and actions the values our leadership projects. A companyâ€™s culture is made visible by every decision leadership makes, and that culture is reflected in the small decisions, made day in and day out, by each employee, at every customer touch point. Companies like Chick-fil-a, Marriot, and Apple, which consistently provide an amazing customer experience, are able to continue this tradition of excellence through the people they hire. Great people want to work at excellent companies with incredible reputations and strong cultural values. We all want to be associated with awesomeness! We all would like to brag that our employer is known for excellence. Or innovation. Or sustainability. Or some other highly desirable value. A commitment to excellence generates a creative, positive work environment where turnover is low and employees are encouraged to contribute to the ongoing pursuit of excellence. When employees are happy to come to work, have confidence in their company and excitement for their product or service, when they have respect for their companyâ€™s leadership and vision, then excellent customer service will be a natural byproduct. No one will have to tell a customer service rep to be nice, they will act nicely simply because they are great people. These members of the workforce are also happy people who are excited about their product. Excitement is infectious, due to this reason employees will become evangelists for your product, dedicated to sharing their excitement for your product or service, and zealous to protect your reputation. They become an unstoppable force for the expansion and protection of your reputation. So determine to be excellent. Be excellent in the little things. Be excellent in the big things. Be excellent in everything. Commit to producing an excellent product or providing an excellent service. Hire only those people who share your vision of excellence. Be excellent and you will attract an excellent workforce. You will be able to choose from the cream of the crop because you will be flooded with resumes and applications from people who want to be associated with the best. Make excellence your goal, not good customer service. A culture of excellence is where truly amazing customer service comes from.